Our recently refurbished Zizzi, situated just off Baker Street, near the lovely Marylebone High Street, is a hidden gem in London. During the day, it's bustling with office workers and tourists, and in the evening, it's a favourite for cinema-goers and locals. Great Italian food - including pizza cooked in a wood-burning oven, and great service, guarantees a great experience every time. Get something smaller as a starter for one, something bigger as a starter for two, or get a bit of everything & share it amongst your table! Add garlic butter/creamy butternut squash/smoky pepper pesto/white bean & basil pesto to your starter! 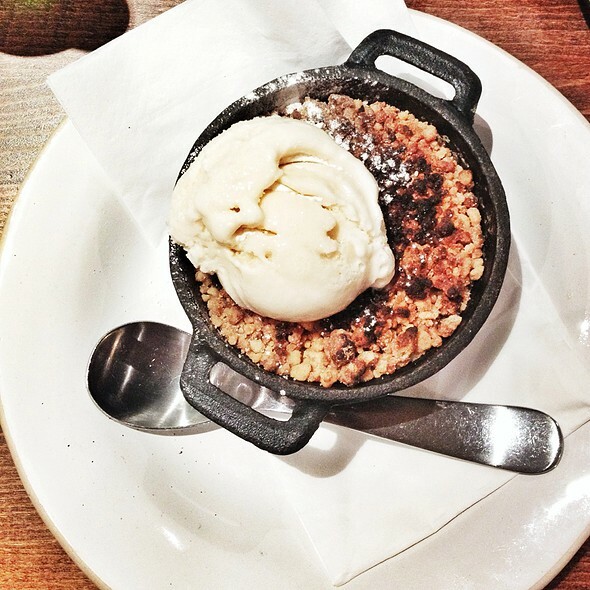 Perfect with our 'Little Soul' Breads! Staff is really good! Kid friendly and great for families. The Baker Street area has lots of restaurants across the spectrum, with Tussauds nearby, the London Zoo not so faraway, and hungry tourists abounding. Zizzi is mid-range. 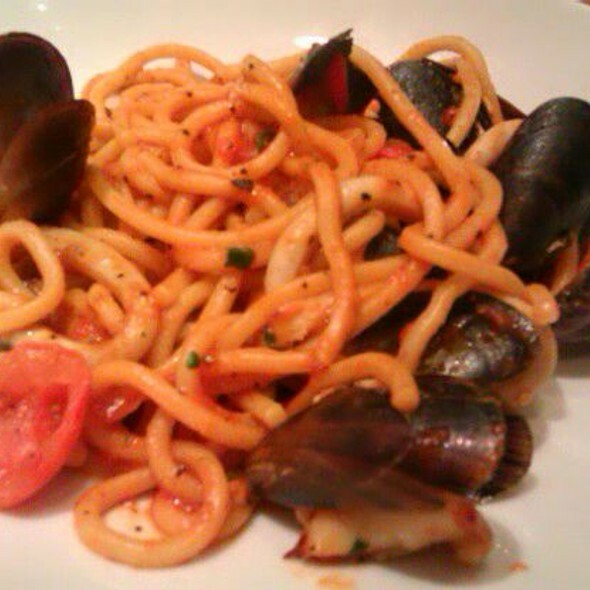 It's big and friendly, with a large menu to match and an inventive menu of Italian and near-Italian dishes. Tables by the window endure less noise than those in the middle. My bufala caprese was imaginatively garnished with basil, and the mozzarella was plentiful. The tomatoes allegedly came from the Isle of Wight. My companion was greatly taken with the the giant olives, pits not withstanding. She followed with a porcini dish and pronounced it satisfying. My pasta had pulled venison in it, which was a first where I was concerned, and there was plenty of it. It's a relaxed place and a perfect post to watch the bustle of Paddington Street. The Montepulciano helped the meal no end. Yes, I was quite happy with it. We booked at last minute without fuss. The staff were excellent as was the food and service. We couldn't fault it. Shame about the people on the table next to us who seemed to be out to ruin everyone's night, especially the staff, by complaining about everything! They were great with getting us our food quickly. We were in a rush due to Regents Park Theatre tickets and had started a little late due to the poor weather. Food was delicious. I would definitely come back, again. Pizza is the best item on the menu. Stick with this and organic primitivo wine with a tire misu for dessert and coffee and you can't go wrong! Excellent service from start to finish. Friendly waiter who catered for our eclectic taste and made sensible recommendations. Really nice place althoug it looked as a simple pizzeria. Service was good! Food ok and drinks and dessert was super! Our birthdayfriend ate lasagne and it was the best he ever had! Recommend this nice place and nice staff!! More staff needed to attend reasonable quicker. They are very effective and nice, but not enough. We love their menu, but they were under staffed and under stocked! Why leave the special drinks menu on the table when they don't have the ingredients?! There was one man running the whole restaurant apart from a bar man and a woman who appeared to be doing hardly any work. The man was running around doing everything so we didn't expect a perfect service however the was no personalisation at all. I booked with a note that it was my partners bday but nothing was done to make this special for her. The starters were nice but my main was a pizza that was quite dry. Met my niece for lunch. Very enjoyable. Love the new look and new layout. A lot warmer in feel and definitely warmer than of all winters! Like the new calzone with porcini and giant ravioli. Staff always personable and friendly. Key reason why we keep returning. Food was good and ambiance pleasant for a light informal meal. Menu is limited unless you are looking for pizza or pasta but you can probably find something to your liking otherwise. Prices are reasonable considering location. Service, however, is poor. I booked a table but none became available until long after booking time and staff were too rushed off their feet to take much notice. They also didn't seem to want to give me my change. Large group booking was good, some small mistakes with the order but overall very good service to rectify mistakes. I had an appointment close by, so we nipped in to have a quick meal. The staff was excellent, service was very quick and food was delicious. 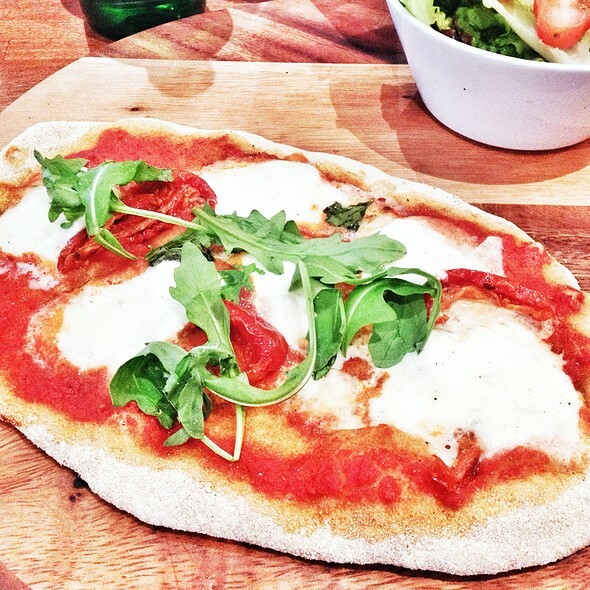 it's exactly what you expect from Zizzi, it's quick and tasty - never disappoint. Six of us had meal at Zizzi in Paddington Street in a Monday evening before going on to the Regent's Park Open Air Theatre. It was fairly quiet but we were made to feel very welcome and had a good table by the window. The food was pretty good for a chain and the service friendly and efficient. We were finished in plenty of time to walk from there to the theatre, so would definitely consider eating at that venue next time we're in the area. Excellent meal and atmosphere. Proseco is however overpriced. Zizzi's on Paddington Street has been a local institution in Marylebone for over a decade. Their pizza has always been one of the best in the over populated 'chain' market. Oven cooked hand-stretched pizzas with regular seasonal additions is something we look forward to. 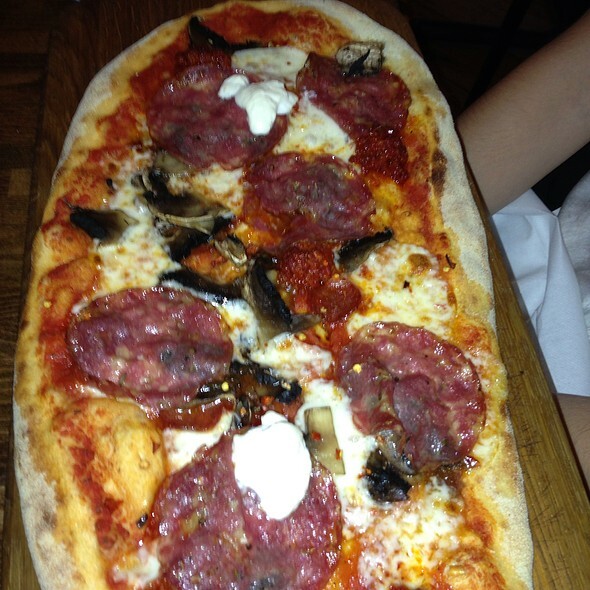 Their rustica - rectangle pizza has interesting topping combinations and rich depth of flavours and textures. Our favourite is the Mezzo e Mezzo. Apart from their fantastic pizzas, they also offer wonderful well-seasoned and fresh fish/seafood dishes like their morish fish stew which you can't get enough of. 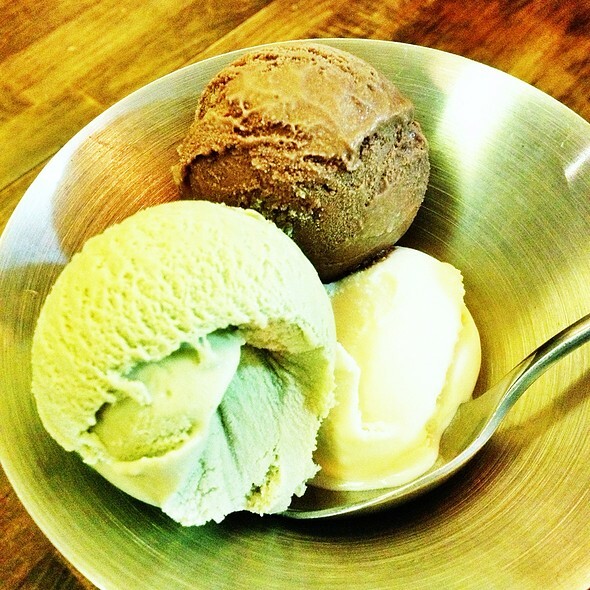 If there is room for dessert, Kitty's gelato and sorbetto will make the meal complete. Food good for an Italian chain - lovely risotto and salads. Good value for money. Staff quite attentive on a quietish midweek, cold, evening. Good to be able to talk without loud music. Better than the average Strada, my usual chain Italian of choice. Staff were friendly, menu is very varied and several special offers on which were very reasonable indeed. You know what you're getting and it was good. Although the restaurant overall looks like it could do with a good clean when you look inside the open kitchen and smell of drains downstairs by the toilets was very off putting. Understand that can be avoidable in Central London, but invest in some plug ins! A small restaurant with lots of menus! Not a huge vegetarian choice but something that I could eat. Overall good value for money but I wouldn't rush back simply because of the small vegetarian choice. Zizzi's on Paddington Street is always packed - this is probably because their pizzas are consistently well prepared, well priced and a vast place for group gathering. Service was efficient depite the floor was packed to capacity. Its probably not the best place for a romantic meal but a definite if you fancy a good rustica pizza and gelato! I am a regular at Zizzi'z Paddington Street and they always provide good food and good service each time. They have friendly staff who are willing to accommodate my slight amendment to the risotto I order and checks that I am not allergic to their ingredients for safetly. Overall, a good experience and excellent meal! Lunch at Zizzi's paddington st is always an enjoyable experience. Staff are friendly and accommodating. Food is always of good standard. I am a regular at this restaurant and they never disappoint! Highly recommend the Zizzi pizzas. My new favourite over Pizza Express! This is a local restaurant that we have visited many times and as usual the food and service was good. The restaurant was obviously very popular as it was packed. And with good reason! The service and food was fantastic - the staff were really friendly and made us feel very welcome in the restaurant. Although, they were a bit stretched at times and we were left waiting longer than expected at times. However, the smells coming from the open-plan kitchen were amazing and our dishes did not disappoint. Well presented, perfectly cooked and tasted delicious. Can't wait to come back! Good place for a quick lunch. New menu with some good additions. Very accommodating in that they fitted in a table for 9 despite having no record of our reservation through toptable. Zizzi - Marylebone; We went for a quick meal prior to going to the cinema. We had a really good pasta but served on a cold plate! The ambiance could be better, there is nothing to absorb sound. The place is all wood floors and tables, bare walls no fabrics. This creates a atmosphere where you can hear conversations from 3 tables away! Service very speedy and great food. Nice spacious restaurant. We arrived at the restaurant at early which was lucky as they had no record of my booking. They had one TopTable booking, but it wasn't mine. Being early, they were able to accommodate us. Next time I will book directly with the restaurant.